It is love at first sight that strikes young architect Max Hauser (Matthias Zera) and waitress Bianca D’Arcadia (Federica Sabatini) when they meet in a Milan restaurant. After two wild days and nights in his hotel room, Max knows for sure that he found the love of his life. 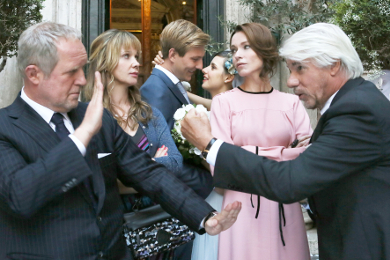 But life goes on: Max has to return to Cologne and Bianca to her family in Rome. But Max can’t let Bianca go. Without further ado, he travels to Rome in search of her and he finally finds her. To his surprise he discovers that Bianca pretended to be a waitress, but in reality is the rebellious daughter of the Count and Countess d’Arcadia living in a pompous palazzo. Max isn´t impressed much by the aristocratic ambiance and proposes to Bianca out of the blue. She accepts his proposal, much to the regret of her scheming mother Gioia (Stefania Rocca) and dandy father Vibaldo D’Arcadia (Ricky Tognazzi), who hoped for an aristocratic son-in law. 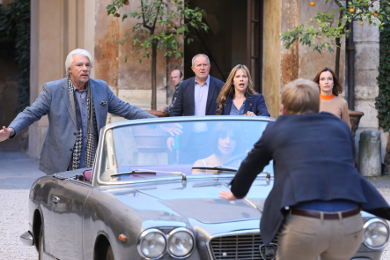 Blindsided by their son’s decision, his wine merchant mother Eva (Ann-Kathrin Kramer) and dentist Walter (Harald Krassnitzer) travel to Rome to get to know Max´s future parents-in-law. Eva wants to take the opportunity of this trip to revive the faded romance between them. Walter has other plans. The culture clash of the Hausers and the D’Arcadias is catastrophic failure as they realize rather quickly that they’ve got absolutely nothing in common. It doesn’t take long until the situation spirals out of control and threatens Max and Bianca’s wedding plans. Suddenly not only is the planned wedding endangered, but also all the parents put their own marriages into question! Wedding in Rome! Ann-Kathrin Kramer, Harald Krassnitzer, Matthias Zera, Annika Ernst, Federica Sabatini, Ricky Tognazzi, Stefania Rocca, Elena Cotta a.a.